basically melted material is fed to this gate from a separate primary gate (after runner), the function of the gate typically is employed for flat and thin parts to reduce the shear stress in the cavity, Tab gate able to used in various material plastic such us ABS, PS, acrylic, PP, PVC, Polycarbonate. SAN and other which has relatively low fluidity. at this type of gate, the high shear stress generated around the gate that trimmed after molded. this gate sometimes also called the collision gate. 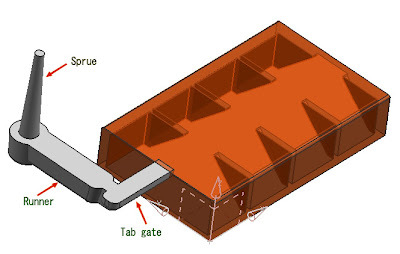 The thickness of tab gate should be the same as the part wall, yo can also make more thin, but when designed parts for cosmetic parts if preferred that the thickness is same with the product thickness. rule number two is, make the gate as center as possible in the product side, but you must consider the product size and shape. each picture is able to enlarge by clicking the picture.